Janet is passionate about designing strategies to help clients achieve their financial goals, live successfully in retirement, financially survive a premature death or catastrophic illness, and allow their estate to pass efficiently and according to their specifications. That passion drives every decision she makes. With careful planning, measured action and sound techniques Janet helps her clients answer the question "Am I going to make it?" Janet's commitment to helping others is not limited to the clients she serves. Janet is a Notary Public*, teaches religious education and is the Chairperson of the St. Mary Wrentham Finance Council. She also supports many other local charities with a focus on youth sports. As a former foster parent, her family has welcomed into their home some of the community's neediest children. A 1984 graduate of Trinity College in Washington, D.C., Janet holds a Bachelor of Arts degree in Economics and Business Administration with a minor in Philosophy. 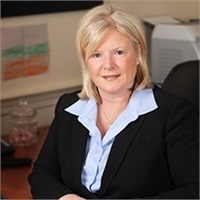 Her commitment to education continued while successfully earning Series 7, 63, 24 and 65 licenses and is entering her 35th year in the financial services industry. Originally from Walpole, Janet now resides with her family in Wrentham, MA. Her interests outside of finance include reading, skiing, biking, cooking and history. She especially enjoys time together with her husband, Dave and their son, Jackson, at their home on Lake Pearl. She has completed 5 marathons and the 173-mile Pan Mass Challenge to benefit the Jimmy Fund. *Notary Services are not provided by Raymond James. Raymond James is not affiliated with and does not endorse the entities mentioned above. Investment advisory services offered through Raymond James Financial Services Advisors, Inc. 1776 Financial Services is not a registered broker/dealer and is independent of Raymond James Financial Services, Inc.